Authorities in Cornwall have said they will learn lessons after hundreds of people were forced by snow and ice to spend a night in emergency shelters. 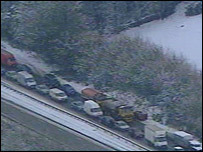 About 1,000 motorists were stranded for hours on Bodmin Moor on Friday when heavy snow ground traffic to a halt. Teachers had to look after pupils for many hours when about 2,000 were stuck in schools as a result of the weather. Cornwall County Council said it would work on new procedures but added that the ones in place helped the situation. On the A30 on Bodmin Moor, drivers were stranded for several hours after accidents blocked roads struggling to cope with 13cm (5in) of snow. Cornwall County Council network manager Mark Stephenson said some of the problems were due to snow overwhelming road treatment work. He said: "We had a very significant accumulation of snow, with about 2in to 4in (5cm to 10cm) falling in about an hour whilst the roads were being pre-treated. "That pre-treatment of salts was not sufficient to deal with that amount." Some parents complained that finding out if their child was safe was impossible on Friday. Trevor Cooper, of the council's school transport office, said: "Having looked at the situation, the major problem we identified was is that it was very difficult for us from County Hall to be communicating with the parents of 70,000 children. "We need to be looking at out systems and make sure than we can communicate better than we did on Friday." However, the leader of the council, David Whalley, said he thought the authority dealt well with the problems. He said: "As it turned out, we were fortunate that nobody suffered unduly. "Now there are lessons to be learned and we will learn from them, but I think that our emergency planners did an excellent job." The Met Office has issued a severe weather warning for Cornwall. It said showers falling onto cold surfaces would produce widespread icy conditions and snow showers were likely. It advised drivers to take extra care.